Reflective practice, which is highly respected in education and social sciences fields, focuses on analysis and evaluation of our thoughts, beliefs, theories, and actions. It is an active and conscious process of active learning (Ghaye & Lillyman, 2006). Besides, reflection is one of the essential tools helping professionals and educators to think about the learning process, conceptualizing it in reality, and facilitating the expansion of knowledge. It can be said that learning is improved if the elements of reflection are incorporated into it. 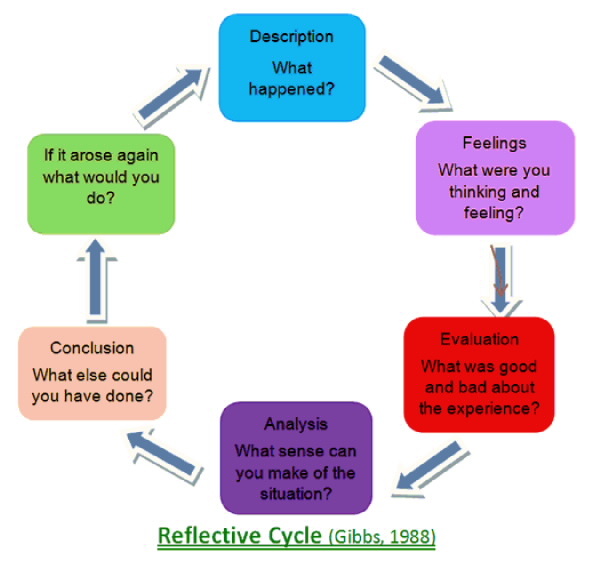 Gibbs (1998) developed the following reflective cycle in order to provide practitioners the structure for reflecting on an experience or situation. Using this reflective cycle, educators and students may reflect back on what happened, their reaction to the situation, their analysis and how to change/improve the outcome. There are several advantages of reflective practice for teachers and practitioners, such as improvement of teaching practice, greater success as a teacher, and improved problem-solving and critical-thinking skills. Additionally, reflective practice may guide educators into discovering their own theories and generating new knowledge. Teachers by engaging in reflective practices stay motivated as well critically oriented. Personal power and self-awareness resulting from reflective practice assist in identifying own strengths and areas for improvement. In order to be a reflective practitioner it is vital to have a reflective strategy, which will help you to learn from own practices throughout the course. There is a variety of strategies that can be used for personal reflection, and I want to focus on two of them: reflective writing and reflection-on-action. Reflective writing is a representation of the process of learning in the form of writing. The main aim of reflective writing is “to enable the person to come to a different, or deeper, understanding of whatever he/she is reflecting on” (Jasper, 2003, p. 143). Writing helps to remember information, see a full picture, and develop analytical skills and critical thinking. Moreover, reflective writing enables practitioners to create new knowledge and gain deeper understanding of what they are experiencing and learning. The stages of analysis, revisiting and standing back are crucial in reflective writing, because it is not just writing things down. It is important to set the rules and control the whole writing process. In my view, practitioners have to engage, create, and challenge assumptions within the reflective writing. It should be personal, for that reason it is important to write in the first person and use ‘I’. The second strategy is the practice of reflection-on-action, which is a deliberate activity which engages people to examine experiences after they have occurred with the aim of learning from the situation and improve future actions. Reflection-on-action takes place through the explanation, interpretation, and analysis of experience. Usually reflection-on-action happens ‘retrospectively’ and outside the work setting (Jasper, 2003). Furthermore, it is argued that “reflection-on-action is an active process of transforming experience into knowledge…” (Jasper, 2003, p. 6). It is more than just thinking about the experiences, it is one of the methods of developing own knowledge and understanding own practice, making sense of the situation and taking action as a result of reflection. In conclusion, reflective practice is increasingly being recognized and valued as a powerful skill for educators and practitioners who are required to analyze and evaluate their performance. Larrivee (2000, p.306) believes that teaching practice can be transformed through reflective practice by emphasizing that “critical reflection is not only a way of approaching teaching—it is a way of life”. Ghaye, T. & Lillyman, S. (2006). Learning journals and critical incidents: Reflective practice for health care professionals. London: MA Healthcare Ltd.
Jasper, M. (2003). Beginning reflective practice: Foundations in nursing and health care. Cheltenham: Nelson Thornes Ltd.
Larrivee, B. (2000). Transforming teaching practice: Becoming the critically reflective teacher. Reflective Practice, 1, 293–307. I totally agree with you that as educators and practitioners we have to develop our reflective practice skills. As part of our job role it is important to carry out reflective practice especially because we work with young people and our effectiveness will have an impact on them and their learning. While studying at NU in PDP course, there were a lot of areas in which I experienced success and one of them was a reflective journal. Since, keeping a reflective journal has become a new habit in my teaching experience. It happened I took notes a few times in the past. With the experience of reflective practice, I have started to take few notes after teaching experiences. At the beginning it was not easy. I have begun to give myself time to get used to keeping a teaching journal. Now I can recognize the effectiveness of writing down ideas and questions to think about later. Time after time, I have realized how much insight I can gain from my journal entries that help me develop my practice. Few years ago I watched a film “Freedom writers”. I think, everytime when we say or hate some writing tasks we have to refer to that film. I am impressed with that film. Now I see hoe this subject pushes us to be freedom writers. before this time I thought somebody will saty or laugh at my writings. Now I think, no others are learning too. Thank you for such opportunity.